The Bailie Nicol Jarvie is a well regarded blended whisky that was first produced in the 1890s. The original version of the blend, or BNJ as it has become affectionately know, was devised by business partners Roderick MacDonald and Alexander Muir during 1893 in the Scottish town of Leith. They named it after a character in Sir Walter Scott's renowned novel Rob Roy - a magistrate who tackled a sword wielding Highland clansman in a remote pub by setting his attacker's kilt on fire! The blend was particularly popular in the early 20th century before suffering a dramatic slump in the 1970s and 80s. The brand was reborn in 1994 by the Nicol Anderson & Co. Ltd, who are also based in Leith near Edinburgh. Today, they remain one of the few independently owned companies in Scotland that still do their own blending. The composition of the blend was changed from the original recipe due to market forces. Only eight single malts from the Highlands (including Glenmorangie), isle of Islay and Speyside (including Glen Moray) are blended together with grain whisky from the Girvan distillery in Ayrshire. In comparison, many blended whiskies contain between 20-40 single malts. The minimum maturation time in a cask is six years and the final BNJ whisky contains 60% single malt and 40% grain whisky. This is one of the highest single malt percentages of any blend on the market. The colour of Bailie Nicol Jarvie is golden yellow and the nose is light, fresh and delicate. There is initial zingy citrus (think of lemon zest) and this is then joined by other aromas, including vanilla, honey, slightly bitter cereal grains, dried grass (imagine straw and hay) and just the smallest whiff of some peat smoke. On the palate, this is again light and fresh with a lovely clean and crisp nature. There is more noticeable peat smoke than on the nose, but it remains subtle and compliments the other notes that are present - cereal grains, toffee, vanilla, dried grass and nuts (think of almonds especially). These notes give the whisky a richness and sweetness but a distinct citrus element (that lemon zest again) comes through and counteracts this. The zingy nature of the citrus is what helps with BNJ's refreshing lightness. The finish is reasonably long for something of this delicacy and is well balanced. The citrus zing and sweet honeyed notes work well with the more bittersweet cereal notes. 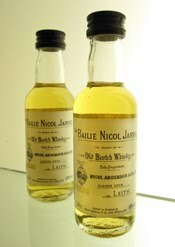 Bailie Nicol Jarvie is bottled at an alcoholic strength of 40% ABV and should cost £15-20 a bottle. It seems to be becoming harder to find these days but can be purchased from specialist alcohol stores. BNJ is a lovely fresh and delicate whisky that is very easy to drink. Some whiskies in this style can be a little wishy-washy, but this has complexity and depth that have come from the use of good quality casks during maturation and the skill of the blender. A good dram at a good value price. I was given a bottle of BNJ some years back for christmas. Agreed, quite nice and good price. I have seen BNJ at Waitrose, at least at West Byfleet. I received an antique mirror which I believe to originate at the beginning of the last century which has a picture of a bottle Ballie Nicol Jarvie Old Scotch Whisky on the surface together with a few other bottles which I cannot find on Google.I live in SA and always wanted to get a bottle of each of the bottles as reflected on the mirror ? BNJ proof quality doesn't need to cost a small fortune. Will drink nothing else! Dan Murphy has BNJ at $35. A tasty drop I agree! BNJ punches well above it's weight. Better than many whiskys two-three times the price. I've been drinking BNJ for several years now, and despite occasional forays into other areas of the Whisky wold, I keep coming back; i.e. I'm now an addict! Nothing else matches for price, or pesentation.